You knew something was up when Fairleigh Dickinson passed on any shootaround, choosing to arrive at the Siegel Center for the first time about 90 minutes prior to tip. What's more, starting point guard Sekou Harris and reserve and defensive-whiz Yves Jules were not available to play. This got ugly from very early on, but the 26th straight Stu sellout (StuOut?) was treated to a record-breaking performance from Troy Daniels, and a fuzzy-topped Shaka Smart. Props to FDUs Kinu Rochford, who posted a granchild-storytime stat line of 30 points and 16 rebounds. Good for him, and good for VCU. I'm betting that stat line makes its way to a white board somewhere at a VCU practice. brought the lead to 39 at 79-40 with 9:15 to go. The final eight minutes of the contest resembled a Henrico County rec league game. route to a career-high 27 points. season and seventh straight win overall. The Rams have now led in games for 373 of 520 total game minutes–71.8% of the season. and near-steals that should've been made. there was spotty execution and some ugly shots when they did execute. opponent who never really had much interest in playing defense. Brandenberg (13) and Graham (10). the nation in steal percentage (19.0%) and turnover percentage (30.4%). three-pointers made list as he now sits at 177 for his career. FDU came into the game second nationally, hitting 42.3% of its threes. The Knights hit only two of 13 on the afternoon. notable, but I never tire of referencing the 2011 NCAA tournament. The Rams have made eight or more threes in 10 of 13 games, and taken at least 20 threes in 10 of 13 games. VCU is now 21-0 under Shaka Smart when posting double digits in threes and steals in the same game. 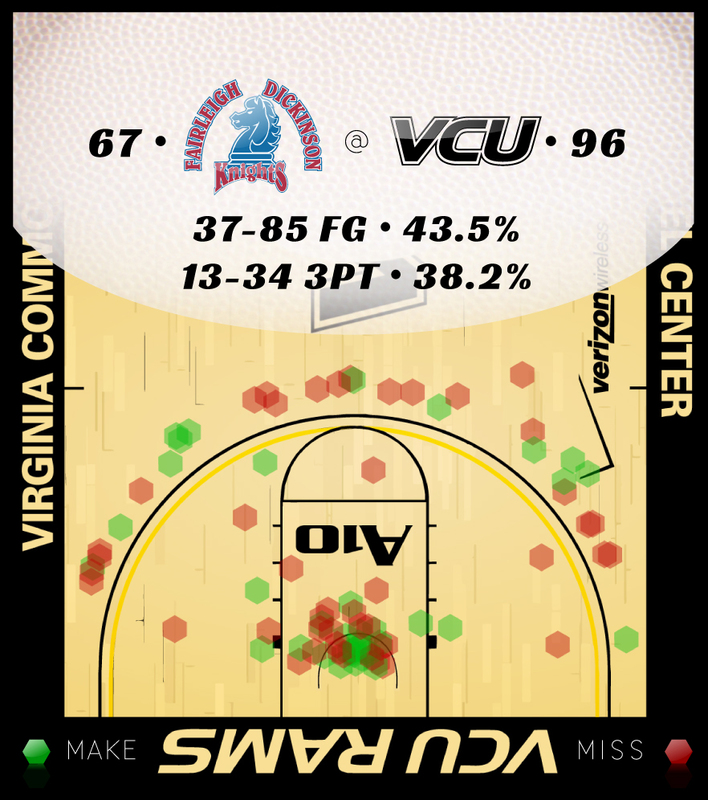 VCU has shot less than 42% from the field just twice this year: Duke (33.3%) and Wichita State (34.7%). 30-point blowout, at home, against an undermanned opponent. Big deal. difficult situations, just like you need to practice free throws. play with a three-point lead, not a 33-point lead. There's a nuance to tight games that matters. You have to gain an understanding of a "good play," because it is defined differently based on time/score situation. You can only gain this understanding by going through it. game, and that moment will not be lineup-palooza because we have a 30-point lead. Daniels hit six-of-eight in the second half. point this season. That matters to this curmudgeon. the freshman. Plus, he made two moves that were eyebrow-raisers. running the show, so they split this honor. he was rewarded for hard play. Reddic hit 9-12 from the field.